This chocolate cake recipe was most definitely not mine. I found it through a tweet sent by Ruth Reichl, former editor of Gourmet magazine, who is always cooking and writing about food. The timing was perfect, because I needed easy dessert ideas for tiny living and travel and there it was. And besides, baking requires measuring, which I don’t do, so I seek outside advice. As it turns out, this simple chocolate cake recipe, called A Cake with a Pedigree: Fast, Easy, Low Fat, wasn’t exactly hers either: She was the fifth in a line of other cooks and writers to have modified it. I have modified it, too, but I am not famous nor influential, so I’ll keep my name off of the list of co-creators. I also did not choose this because it is low in fat. I did choose it because its ingredients list is basic and always on hand in the travel trailer, and it is most definitely takes very little time to make. Chocolate Cake in Spring Form Pan. Ruth says, “It’s not the most spectacular chocolate cake I’ve ever baked, but it certainly is the easiest.” I think that this is all true. I tend to like a more moist cake, so my only addition to this recipe is that I add a tablespoon of Nutella and a tablespoon of honey to it, because I also always have these two items in my food stash (Luna’s adores Nutella). 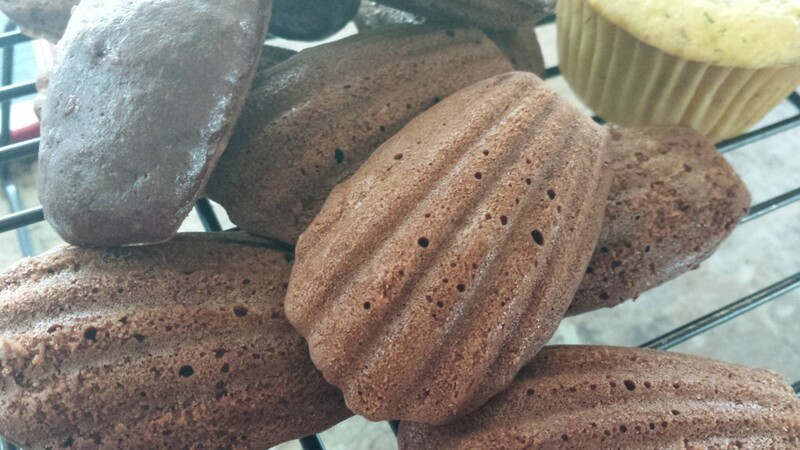 Chocolate Madeleines. Not Completely Classic, but Luna Doesn’t Know That. Furthermore, I use the batter for various dessert forms. Sometimes I use it all to make a cake, which I bake in a spring form pan lined with parchment paper, dividing it after it has cooled and saving some for later, which helps for surprise dessert. Sometimes I split the batter in half for madeleines and chocolate muffins. 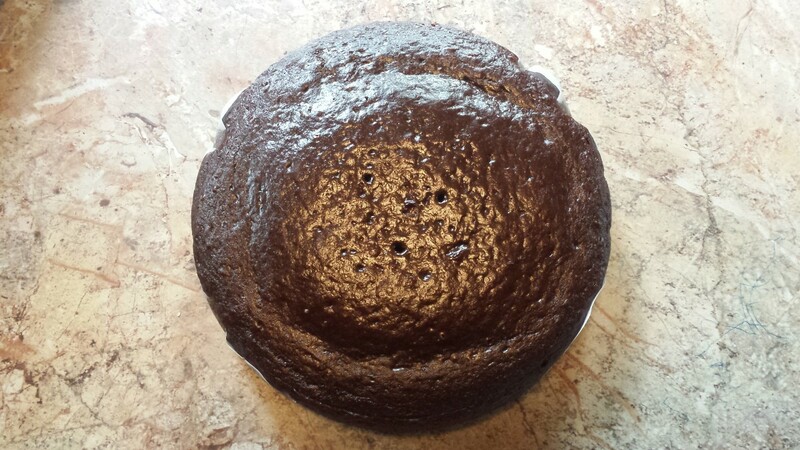 Any which way I use it, this chocolate cake recipe will work well for anyone needing a quick dessert, and it works really well in a camper stove where tricky baking is often part of the program. Sprinkled with a bit of powdered sugar and you have something delicious and sweet to serve. I hope you give it a try. Butter and flour a 9-inch round cake tin, or line the bottom of a spring form pan with parchment paper, buttered on both sides. Mix the flour, cocoa, sugar, baking soda and salt in a medium size bowl. Whisk in the buttermilk, oil, honey and vanilla. Fold in Nutella if desired. 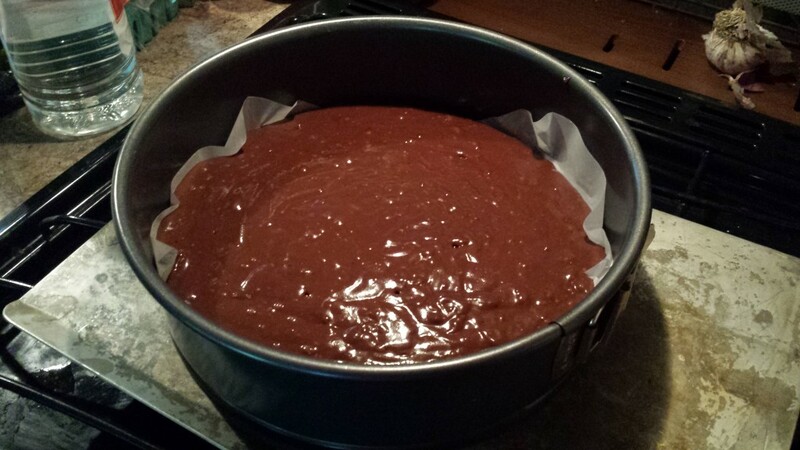 Turn into the cake pan (the batter will be fairly thick), and bake about 30 minutes, or until a tester comes out clean. In the case of the camper oven, you may need to bake it for 35 minutes. Test at 30 minutes and adjust accordingly. Put on a rack and allow to cool for a few minutes before turning out of the pan. If using a spring form pan, cake cooling is easy. Optional baking ideas include making muffins or madeleines. For muffins, pour batter about two-thirds full into 12 muffin cups, allocating the rest of the batter to 12 madeleine shells, the molds of which have been buttered. Of course you can make two dozen muffins or two dozen madeleines. Just experiment with your baking. It's such an easy recipe that you can't go wrong!